Add-ins will play a critical role while identifying the objects in QTP. After the successful QTP installation, find the below step by step procedure to load the required add-ins into QTP 10.0 . Please find the step by step procedure to get more add ins into your QTP. 1. Go to start--> settings-->control panel-->Add or remove programs and it will open Add or Remove Programs wizard. 2. 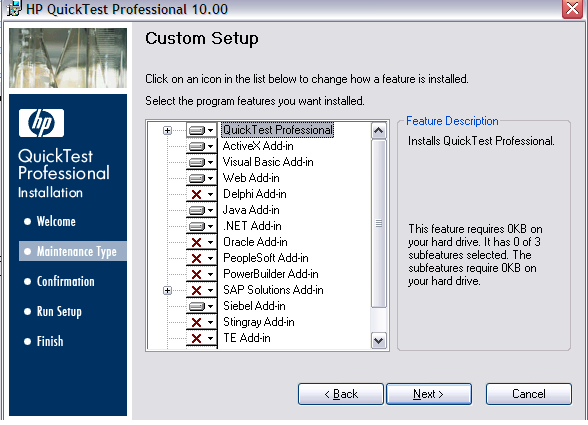 Select QuickTestProfessional and click on change button in the Add or Remove Programs wizard , it will open HP QuickTestProfessional 10.0 setup wizard. 3. 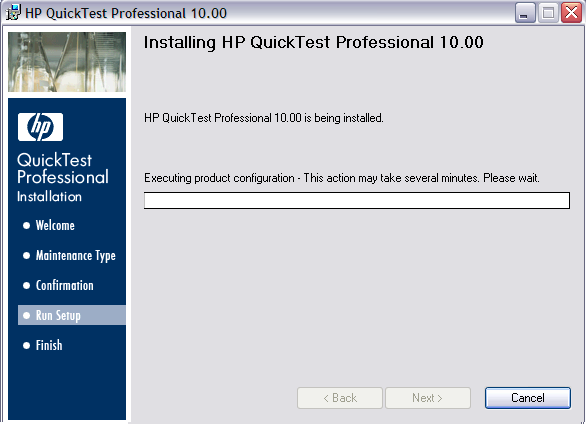 Click on next button in the HP QuickTestProfessional 10.0 setup wizard and it will open HP QuickTestProfessional 10.0 Maintenance Type wizard. 1. 4. 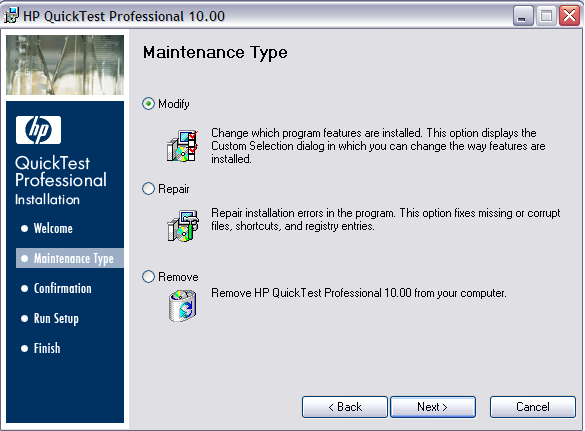 Keep the radio button as default (Modify) in the HP QuickTestProfessional 10.0 Maintenance Type wizard and click on next button, it will open HP QuickTestProfessional 10.0 Custom Setup wizard. 1. 5. Select the required add ins from the wizard as per your project requirement by left click on the add in required and select the option as shown in the below screenshot. 6. 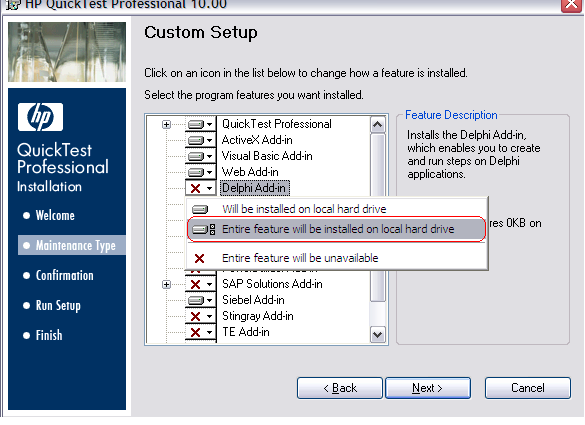 After selecting the required add ins, Click on next button in the HP QuickTestProfessional 10.0 Custom Setup wizard and it will open Confirm installation wizard. 7. 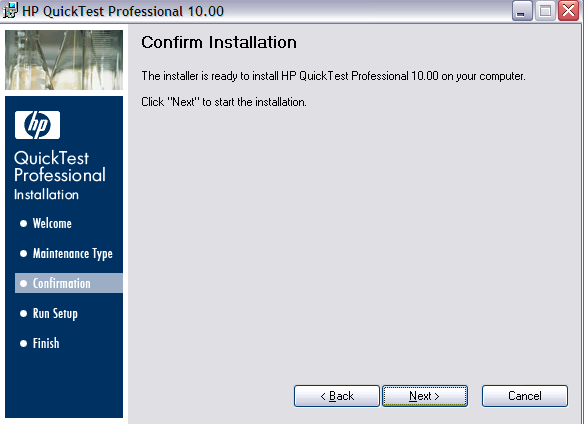 Click on next button in the Confirm installation wizard and it will open Installing HP QuickTestProfessional 10.0 wizard. 8. 8. 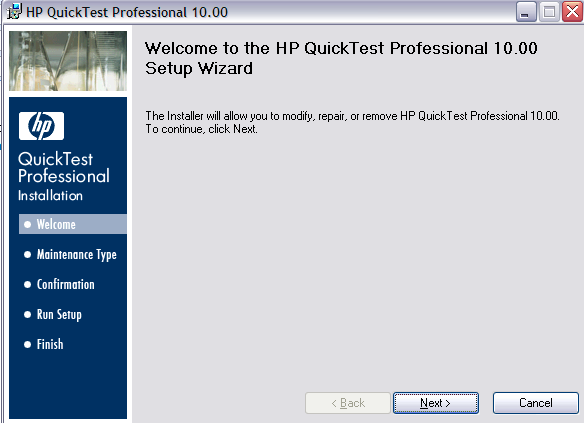 After few minutes it will open HP QuickTestProfessional 10.0 Installation Complete wizard. 9. 9. 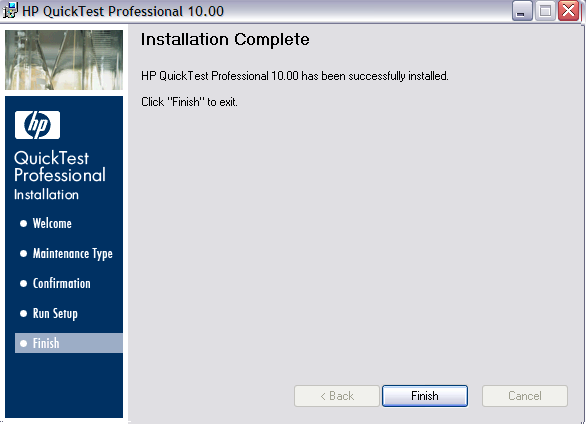 Click on finish button in the HP QuickTestProfessional 10.0 Installation Complete wizard. It is always better to restart to your machine after done with the operation above to reflect more add ins into your QTP. Hope this will helpful for those working with different projects J. Note : We can also load the required add-ins by simply selecting from the Custom set up window which will come during installation .